A box of Excalibur and 2 of Prizm...yes, two! Yesterday was definitely what would be described as a rollercoaster. It started out spectacularly, but then turned horrible...as is the norm for me, any good thing is offset by something horrible happening. But the good thing that happened yesterday...what a good thing it was! I was more than surprised to receive a message in my inbox from someone asking my address, as they wanted to send me some boxes...I am not going to say who it was but I will say that I am forever grateful. Said boxes arrived yesterday, and I didn't know what to expect. Inside were 2 boxes of Prizm, and one of Excalibur. I couldn't be happier. 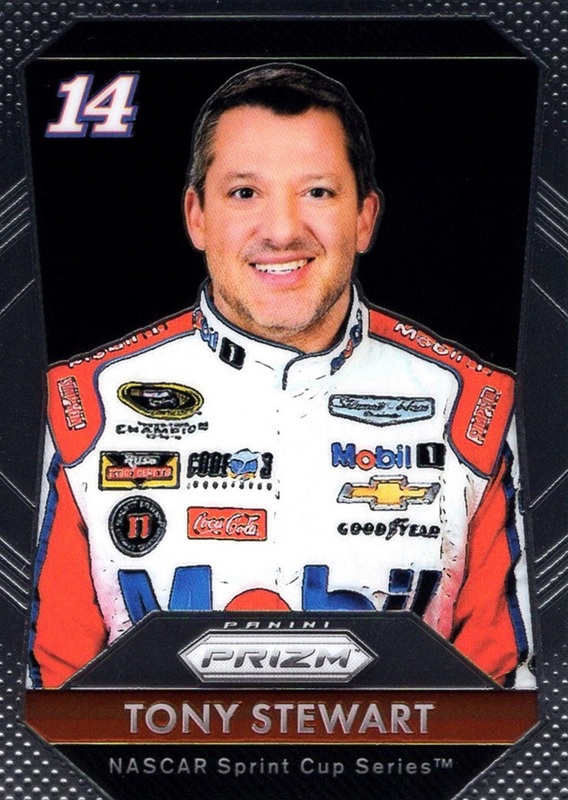 Prizm is one of my favorite NASCAR sets in years, and has now become the first NASCAR set I've ever opened three boxes of...considering I've been collecting NASCAR since Christmas 1992 that's pretty amazing! Excalibur is a set that I really liked, but the hobby box was out of my price range...there's no way I can justify spending that kind of money on a box anymore. Prizm is the first time ever that the Refractor/Prizm technology has ever been used in NASCAR. 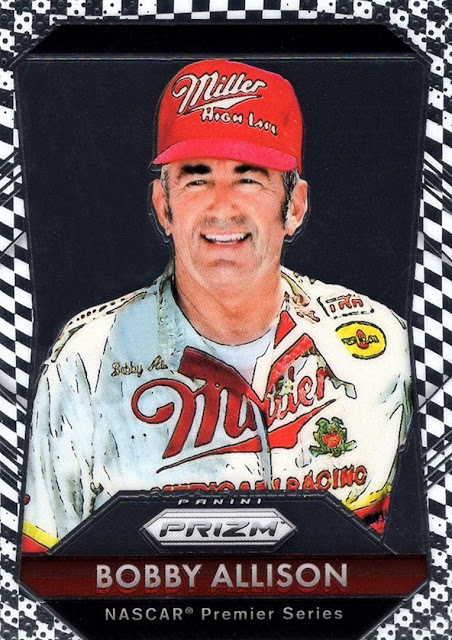 In the hobby box, retail blaster and two retail hanger packs I did, I didn't get a single Prizm of any of the car cards. In these boxes, I got four of them! The autograph in the other box I pulled was Greg Biffle, in possibly the greatest firesuit design ever in NASCAR history, sadly worn only once, at this year's Daytona 500. 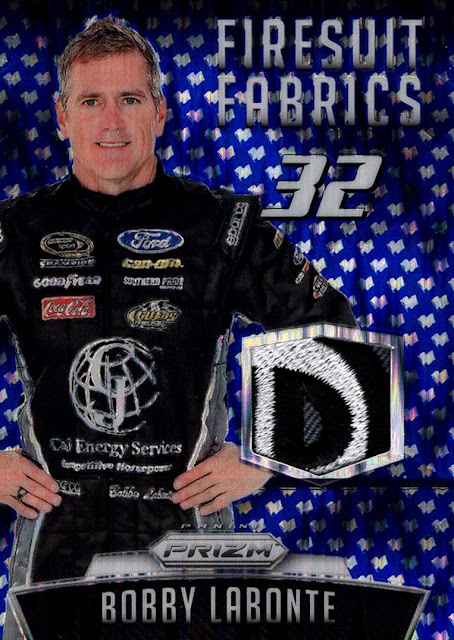 With the one-race KFC sponsorship, his suit was made to look like Colonel Sanders. Here are some of the Prizms I got. They don't really scan well, but...they look spectacular in person. 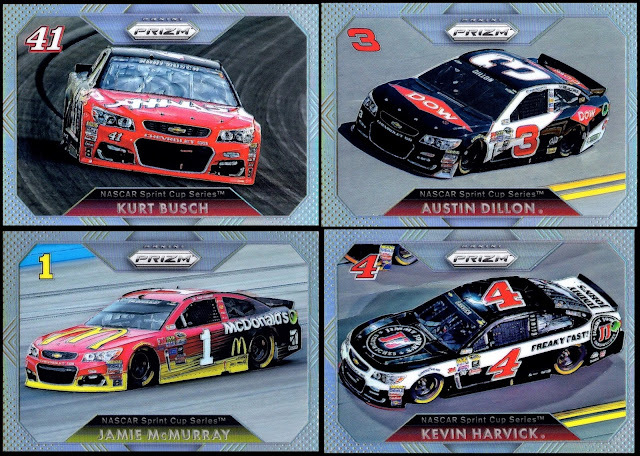 Not shown (as they are already on the Trading Card Database) : #1 Jamie McMurray, #10 Danica Patrick, #11 Denny Hamlin, #65 Jimmie Johnson, #76 Kyle Busch, Variation #9 Bill Elliott. 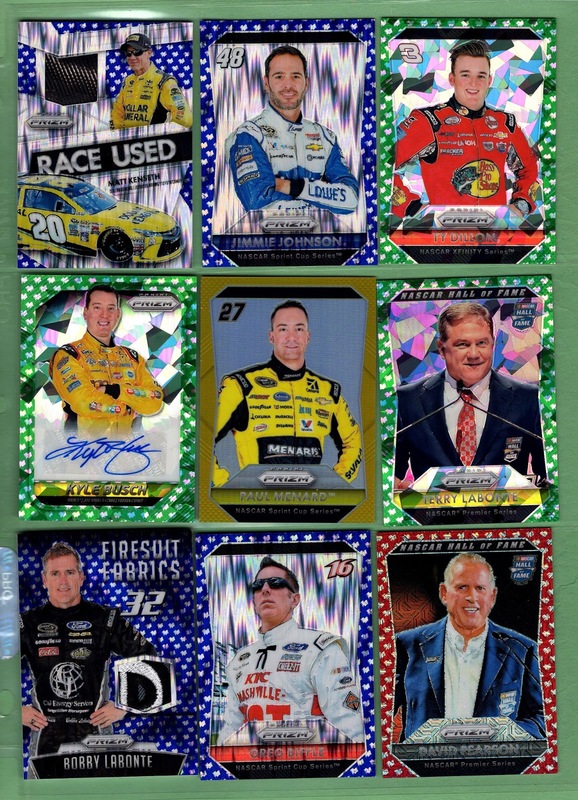 The Darrell Waltrip on the bottom right is die cut. Here are the 4 car Prizms I got. I love these! These are in card number order, my OCD wants to put them in car number order, hah! 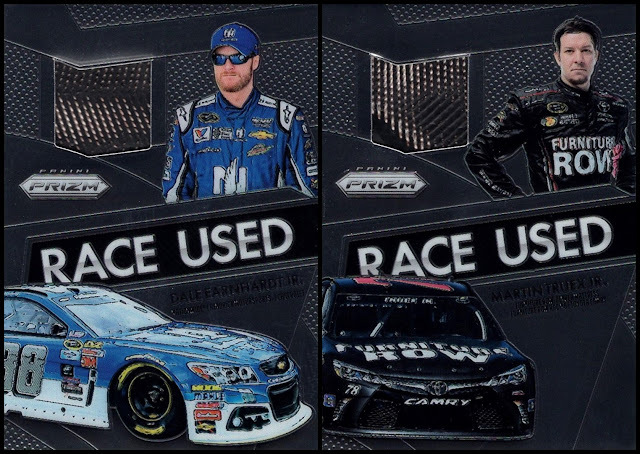 I also got two of the Race Used tire cards which seem to be one per box. I could literally not be happier, as these are my two favorite current drivers. Both pieces show some of the cording in the tires as well...cool! I did these two boxes first, as like I said above, I did a box previously. 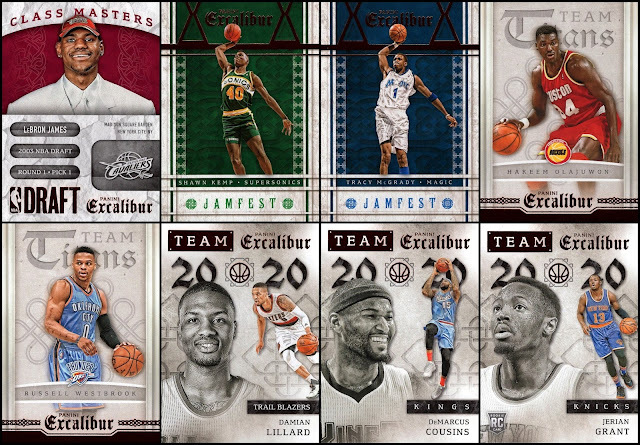 Excalibur, however, was something I did not do much at all on this year, which is a shame as I really liked the set. It has two things especially going for it- it's the only real set of 2015-16 to show players with their new teams who were traded at the Trade Deadline, and it's the only set where the majority of the cards are sorted by team! As someone highly OCD, I like that a lot. (If I were making the set composition, they would be sorted by jersey number in team alphabetical order, so card #1 would be the lowest number on the Atlanta Hawks, #2 the second lowest jersey number, etc). This is now the largest jersey piece in my collection! It's also only my second card of Jokic, so it's far and away the best card of him in my collection. He was kind of a surprise this year for the Nuggets, he was not really heralded, and in fact I first learned about him when I watched a preseason game of the Nuggets- not to brag but I usually stay on top of who is in the NBA...I'm addicted to the game. If I remember correctly, he even ended up finishing 3rd in Rookie of the Year voting behind Karl-Anthony Towns and Kristaps Porzingis...so we're talking some serious talent here. I fully expect him to be a regular in the 2016-17 sets and beyond. 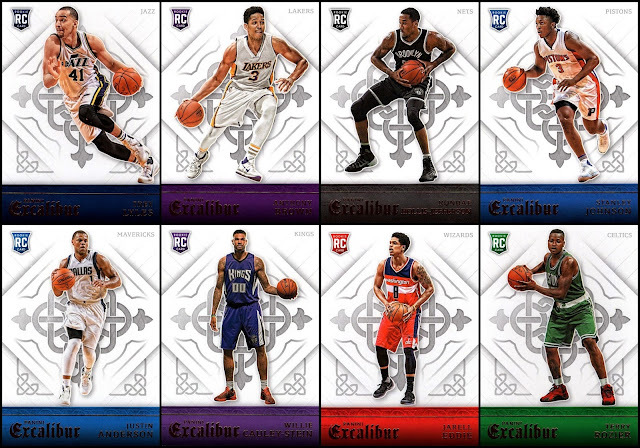 Here are the rookies, including my first card of Jarell Eddie of the Washington Wizards. 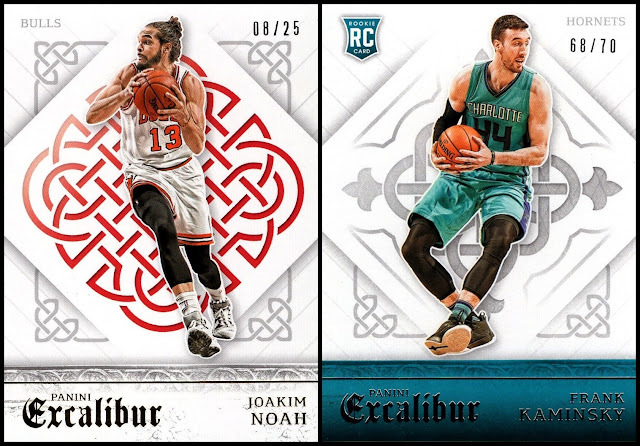 I like how the rookies have a team colored border on the bottom, but I like the team colored scrollwork on the base cards. 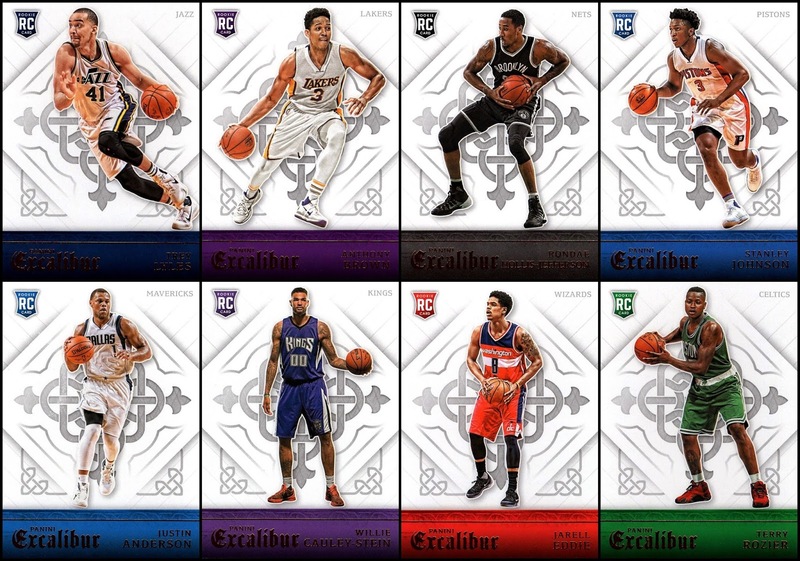 I would like to see the 2016-17 set combine the two with team colored scrollwork AND border, possibly using both of the team's colors...though that might be hard with the Nets and Spurs, which both use black and white. 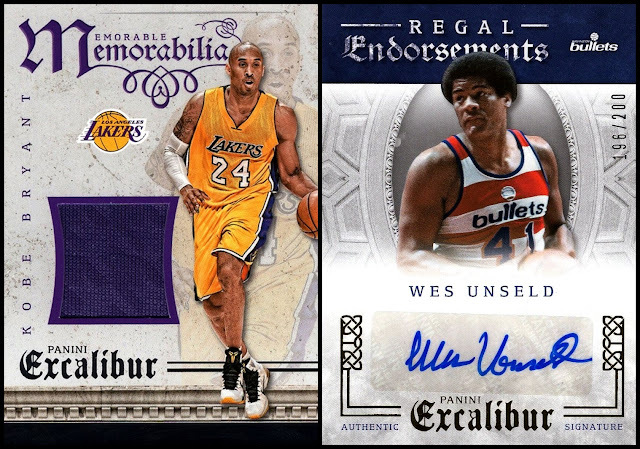 Excalibur's Hobby Box provides three hits, and I got some other good ones to go along with the Jokic. Kobe Bryant needs no introduction, but Wes Unseld might as he's been out of the public eye for a while. He was one of only two players in history to win MVP and Rookie of the Year in the same season! (1968-69). He led the Bullets (now Wizards) franchise to it's only Championship and then coached the team. His son Wes Jr. is still a part of the franchise, I believe. He is a Hall of Famer and is pretty much the best player in Franchise history (Some might say Elvin Hayes, but he also played elsewhere, while Unseld was only ever with this team). I'm very happy to add these two to my collection. It's my second autograph of Unseld and he is the only person with a last name starting with a U to appear in my autograph collection. You also get three numbered Crusade inserts per box. These are Prizm technology although not marketed as such. My favorite is the Blue, made even more visually impressive by the throwback uniform Cauley-Stein is wearing. I got two numbered parallels in my box. The Noah is a Gold and the Kaminsky is a silver. I like that they are numbered on the front- something that you don't see much of anymore. And then the inserts. I'm not normally a big fan of inserts, but these aren't bad. The Team 2020 set is my favorite here, as it profiles players who might be superstars in the year 2020. I didn't have any before, now I have three. Can't beat that! 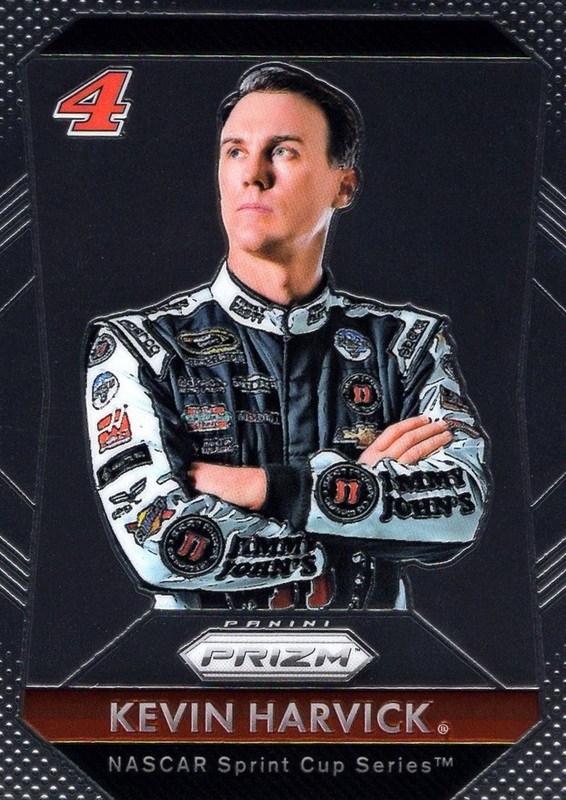 Unlike most recent inserts, the Team 2020 and Team Titans have writing on the back...Jamfest and Class Masters just have the player's name, team and card number. I want to thank the person who sent these to me once again...it made me truly happy, something that's few and far between...these cards will give me years of enjoyment. Kevin Garnett's retirement is the end of an era for me. Kevin Garnett announced his retirement from the NBA after 21 incredible seasons today, and I'm not happy about it. I've been a big fan his entire career, true, but there's more to it than that....KG is was the last player in the NBA who was active when I discovered the sport in February 1996. 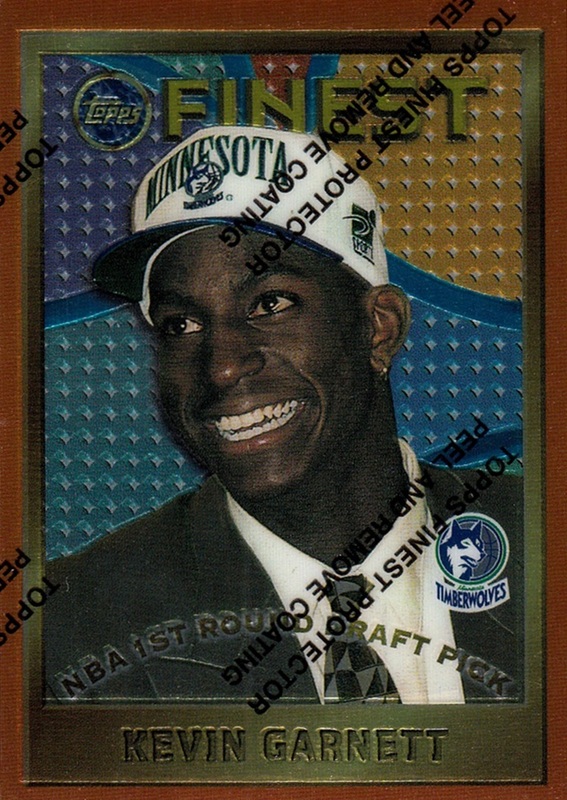 I remember when the T-Wolves debuted their new jerseys in 1996-97, only the second design in franchise history, how badly I wanted to get his road blue to wear around. I was never able to find it, back then in those pre-internet days you were at the mercy of what you could find in local stores, and me being a fatso, I was never able to find one big enough...I never got it. 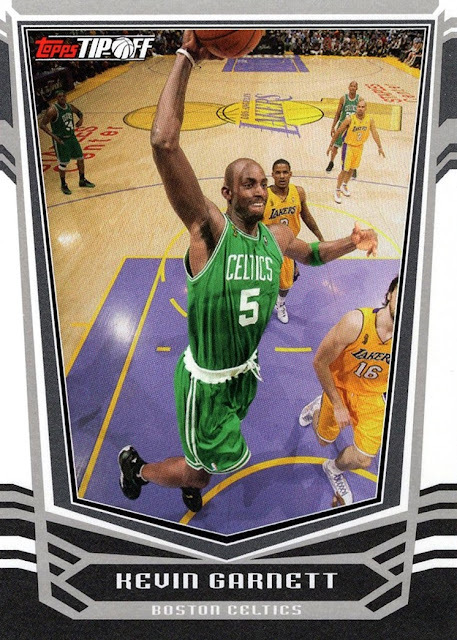 I also remember, when I came back to the NBA after my break from 2006-12, how badly I wanted to get a card of him with the Celtics. I now regret my break immensely, considering it one of the biggest mistakes I ever made, but during that time he was traded from the T-Wolves to the Celtics, where he would win his only NBA Championship. When I took the break in 2006, the first game I watched (or at least remember watching) was when the Celtics won the NBA title. I have since added several cards of him with the Celtics, but getting that first one (2008-09 MVP) was a memory that I treasure. This card, his 1995-96 Finest rookie, was in my Top 5 most wanted from the time it was new until I finally got it, in mid 2015. Amazingly, I don't think I ever shared it to the blog. This was my best pull of any of his cards (I have over 500 different of him, he ranks in my Top 5 of most cards) It also depicts the black variant of the blue jersey that I mentioned above. While not the first Celtics card I got of him, this one has my favorite photograph. I just scanned it yesterday, so that was timed nicely. I haven't even labeled the scans yet. While with the Nets, he wore the #2 in honor of his friend Malik Sealy, who was killed when a drunk driver hit him while he was on the way home after a birthday party for Garnett. In mid-2014-15, he was traded back to the Timberwolves, and finished his career with the franchise that started it all. I've shown this card before- I was watching this game and he got the ball and had a fast break dunk, it was shades of the KG of old...but it turned out to be the last highlight of his career, as injuries just took too much of a toll and he ended the season unable to play...he attempted to come back for one final season but just couldn't do it, retiring now, just 4 days before training camp opens. He ends his career tied for longest in NBA history at 21 seasons played. He also earned more money than any other player in NBA history...including Michael Jordan, Kobe Bryant or LeBron James. There had been some talk that after retirement he would become a partial owner of the T-Wolves, but that was before a portion of the team was sold to Chinese investors recently, so I don't know if that is still in the cards. I hope so. NBA rules prevent players from owning or coaching a team while they are playing for some reason. Personally I would think a person who has more interest in a team than just employee would be more of a motivator, but nobody asked me! For me, now going forward, it's a weird feeling, as every player in the league has now come in after I started watching. Although, due to the break I mentioned above, I didn't get to experience the full rookie impacts of the 2007-11 drafts, but none of them- not a single one- has always been there. 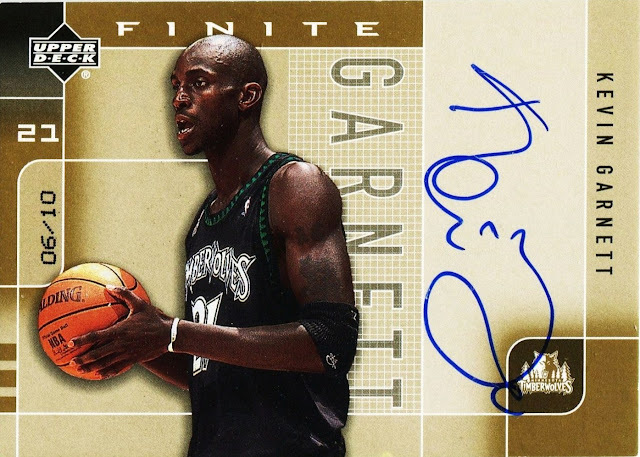 Every single player in the league now is somebody I got to learn about as it happened, where with KG, he was already part of the league's history before I discovered the sport existed. I'm sure I'm not explaining it well because I am not even happy with this paragraph, but hopefully you get the drift of what I'm trying to impart. I knew this would happen eventually- I have no plans of ever leaving the sport again- but to have it actually happen is a weird and not particularly pleasant feeling. Still, it's been fun to watch him play all these years, and I have many memories of watching him play that I will treasure. My favorite, I think, was with a game against the Nuggets. I believe it was a playoff game, probably 2003 or 2004. During a timeout, he just casually went over to the Nuggets' huddle, and they didn't even notice! Not only that, they included him! The T-Wolves won that game, of course. 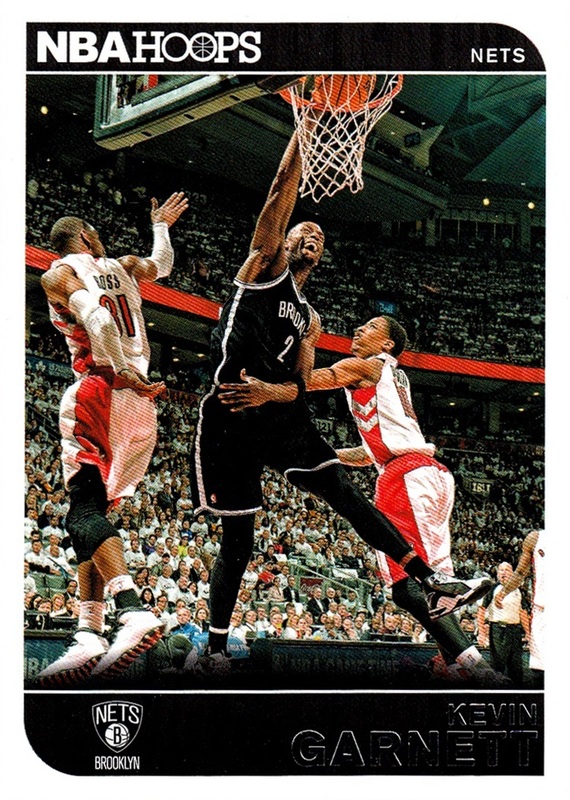 In fact, it's one of my favorite memories of the NBA at all. My mom and I still laugh about it (we watched the game together). 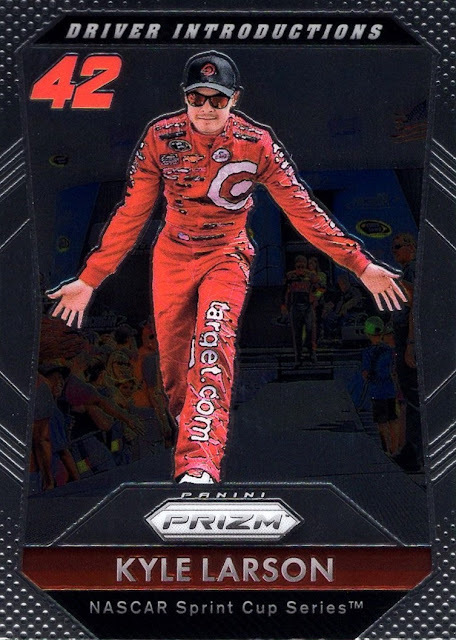 A while ago...quite a while now, more than a month!...my brother took me up to Target hoping to find the new Prizm NASCAR set. They didn't have it yet, which tells you how long ago this was as my first post of this month was when I did find them there. What they did have was this cool little box, which had a piece of floor used in the 2011 NBA All-Star game, as well as some packs of cards and a promised Kevin Durant rookie card. 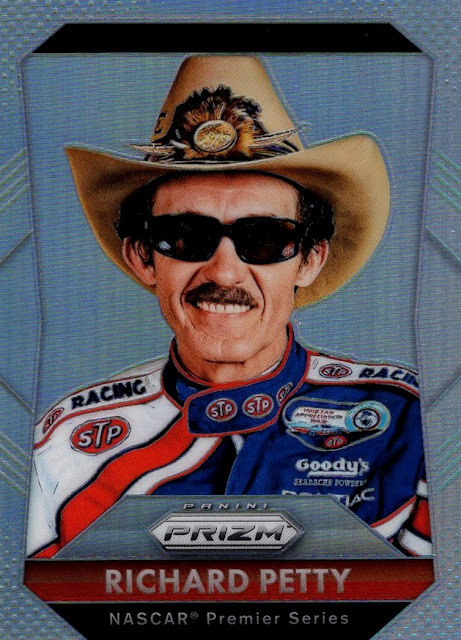 While I have more than a few floor pieces as cut into slivers and put onto cards, this is an actual piece of the floor- really, memorabilia more than anything else, which is not something I have a whole lot of in my collection. It was pretty cool though, and he got me both of the boxes they had. The cards inside were, unfortunately, identical. Both boxes had the same Kevin Durant card, and it's an insert, not a rookie card as defined by Beckett and most everyone. Even more troubling, is that I already had it. In fact, I have 5 of them now. (anybody want to trade? I can trade more than one of them!) Both boxes also included 2 packs of 2013-14 Hoops retail and one 1990-91 Skybox pack. I didn't get a single new card in either Skybox pack but I may have gotten a couple of condition upgrades. Not all my 1990-91 Skybox cards are in the best shape. I won't know for a while. The Hoops packs each yielded one new red parallel and one insert, but I already had all the base cards from the first box. The second box was much better, as I got 4 new base cards- #259 Brandan Wright, #30 Kawhi Leonard, #241 Josh Smith and #60 Tony Parker. That brings me to 9 cards short on the 301 card set, so the possibility of completing it at some point in the not too distant future is pretty good. I've only completed one of the Panini era Hoops sets, my favorite set from each year, so that would be a happy occurrence. I opened one of the boxes the day I got it and held onto the other one until today, 9/22/16. I don't remember which relic I got in the first box, but this one- although you really can't see it due to the glare from the penny sleeve- is a Luol Deng from 2010-11 Timeless Treasures, a set that was represented by only one card in my collection previously, so I'm quite happy with that. It's also SN 31/99 so that's pretty cool. Card wise it's the highlight of the box because it's such a rare set for my collection. The TeenyMates, I know almost nothing about them. I had gotten a Denver Nuggets one as a "bonus" in one of the Fairfield Repacks but I had no idea what it was at the time. Now I do. They are kind of cool. In this pack I got Los Angeles Clippers and West All-Stars. I left the packs in the image instead of cropping it closer so you can see how small these guys really are. They have a hole on the bottom of the figure that reminds me of the grade school days where you could get stuff to put on the top of your pencil. I don't have a pencil handy to test to see if they fit, but it's what it reminds me of. Here is a rather craptacular photo of the floor piece. Sorry about that. Really not feeling too good today and it's the best photo I got of it. It's the star of the show and the worst picture. It looks like I held the camera too close to the floor piece, but even though I took it only about 3 hours ago, I don't actually remember taking it, and I'm not really sure I could get a better one as I took several and this is the best of them. It's just one of those days, I guess! Thanks for reading and thanks to my brother for buying these for me! Hot Dawg, we have a winner! Fast forward to today, I receive a package from Angus in the mail- with a little help from Night Owl, who physically put it in the mail to save on international shipping- I had no idea what would be in the package but he said I hoped I would like it. To say I liked it would be an understatement! First out was the Bill Walton base card from Golden Age. I consider this a multi-sport set but I had never opened any of it. 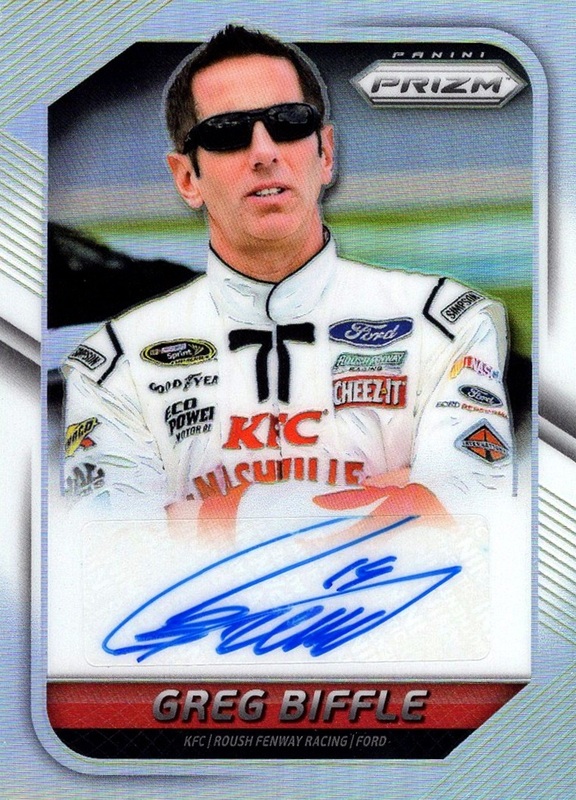 I didn't have the card so I was happy to have this oddball...and then I turned it over and saw the Autographed card with it! WOW! Always great to get an autograph from a Hall of Famer. He remains the only player in NBA history to win both MVP and 6th Man of the year, he also has Rookie of the Year on his resume. The photo on the autograph looks to be from his time with the Celtics, which is where he ended his career. Next came the LeBron insert from this year's Complete. I really liked Complete a lot (I've mentioned the set several times) and someday I hope to complete this insert. Now I am one step closer. Then came out the Estrellas set...As much as I like everything Angus got me, this is the star to me. I've read about this set in the past, but I've never seen it in person before. This set was issued in Spain and is from the 1988-89 season. They are dated 1988 but include the Charlotte Hornets, so that lets me know that they are 1988-89 and not 1987-88. I'm not sure they are 100% licensed, but I don't care. This is a complete set with a little sticker in the orange wrapper. I didn't know this set has any inserts, and I wasn't sure how to get it out, but as I was looking at it while making this post, the two halves of the orange wrapper just gave up the adhesiveness and now I have access to the Magic Johnson sticker. I love oddballs! I've been aware of this set for about 20 years and now, finally, I have it! The set is sort of like a game card but not quite; it includes player stats on the bottom of the front, rounded corners, and they all feature the NBA logo on the back. They are smaller than standard cards, just a couple of millimeters smaller in height but in width they are a quarter of an inch smaller. The Sporting Greats Motor racing set is still factory sealed, or it was. It's opened now. It features F1 drivers, many of whom are new to my collection. Despite F1's popularity on the world stage, they are pretty rare in cards. The cards are just a touch wider than the Estrellas cards and are based on playing cards, with a singular back and all information on the front. These are, however, fully qualified trading cards in my opinion and will be only the second F1 set to join my collection, after 1992 Grid. I had seen some of these cards on the Trading Card Database recently when making sure every driver had a PID, but I didn't really know anything about them, such as card size or distribution method. Now I do, as they have joined my collection! Thanks again Angus, the package was great and yes, indeed I am thrilled with what you sent me! Make sure you go follow his blog, it's the only Football based blog I read, and he's proving to be one of the most generous people among a group of known for being generous people in the blogospehre. Fair warning: there's not a lot of cards in this post. There are some, later on. It's also likely to run long. Text in blue (and all photo captions) written after the show. While I've been physically limited in what I can do for a while, (some days are better than others, of course) this did a real number on me. One thing it did was take away things I WAS able to do previously. I still don't have the stamina fully back yet; I've been told I may NEVER have it back. The heat takes more out of me that it did before. An example, last year I walked around for 45 minutes at a car show, in August. It was about 90 degrees...and afterwords, I couldn't really walk for 4 days. I only wish I was exaggerating. I was so bad after that that I couldn't even make my own lunch in the microwave. It took more than that away from me. I had to stop collecting 1/64 NASCAR diecasts. That was #1 for me for many many years. 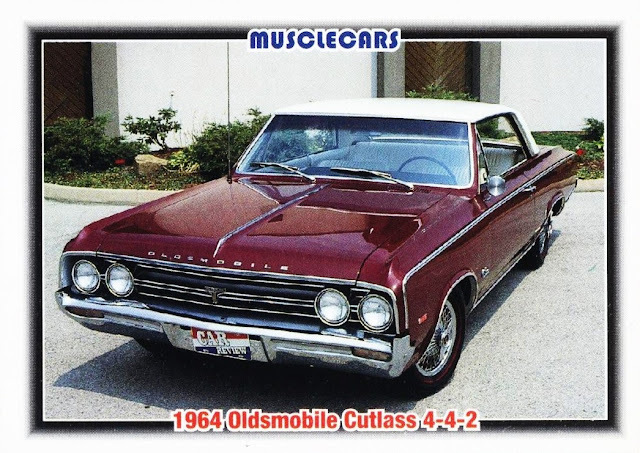 But the money to pay for the medicine which keeps me alive, which costs at the very least $500 a month, sometimes more (it fluctuates constantly) had to come from somewhere, and it had to come from the diecast collection. It cost me the ability to sit Indian style. I used to sit like that all the time- I used to prefer sitting on the floor to the couch or any chair. Now, trying to sit like that causes me intense pain that lasts for several days, and getting up off the floor is almost impossible due to the pain it puts me in. I've found work-arounds for some/most of the above that I've lost. Even if I have not done that, I've made peace with it and accept that it's not possible to be part of my life going forward. The one thing that it took away, and that I miss the most...is Lake George. Lake George, NY, is my absolute favorite place in the world. I had been to it every year of my life, sometimes more than once a year. In fact, more than once I've spent an entire month there with my family, although it's been more than a decade now since we could afford to do that. Lake George is on the very edge of where we could drive to and back home in one day, or at least, it used to be before my health and my mom's health had major issues in 2013 and 2014 respectively. We were both hit pretty hard in back to back years...and it cost us our ability to travel. It doesn't help that our Jeep is pretty much officially dead. It last moved under it's own power in October 2015, and it's looking like it might never again. It's from 1994, and we've had it since 2003, but it's made it very hard on us not working constantly. (Even when we do get it "fixed", it usually lasts for only a few months before breaking down again). We can't really trust it to go father than we can walk home from. That's basically to the post office and McDonald's and back. I have not felt comfortable with my ability to travel since I got sick in 2013. The farthest we've traveled is an hour and a half, to the NNL East in New Jersey. I was able to do that trip with no problem, but Lake George is double that. I didn't feel safe being that far from home. It's probably more mentally based than reality based- but at home, if my number gets low, I've got plenty of things to choose from to fix it. When my number gets low, I can tell by shaking. My body will start to shake, starting with my left shoulder and moving to my other shoulder and both legs, usually. I'm afraid that if my number got low while riding in the car, I wouldn't feel it, and a low number is actually MORE dangerous than a high number. But I think I'm in enough control now that I won't have to worry. In fact, no matter what I do, my number is usually too high anyway. To be honest, I'm still a little worried, but...we have gone back to Lake George! I'm writing this up well in advance but I have felt ready to go back since roughly May of this year. My favorite day of the year is always the day of the Adirondack Nationals, the best car show I know of! It's held at the Fort William Henry grounds- an actual fort from the French and Indian War of the mid-1700s, at least the grounds. The Fort itself is a recreation of the original- with original artifacts on display- after it was burned during the war. (The area also played a major role in the American Revolution). We found a place that is affordable, a little out of town. The place we had been staying since 1987 unfortunately went out of business in 2014. It was right on the lake. Normally most places jack up the prices for the car show, but this place doesn't. I don't plan to post this until we get back home, but I've known we were going to go back since late July. I have to say, August has been dragging. The Olympics helped quite a bit, but since the Olympics ended, it's been about a week...but it's dragged on like it was an entire year. I'm back home now, and this trip was everything I'd hoping it would be. Just about perfect. 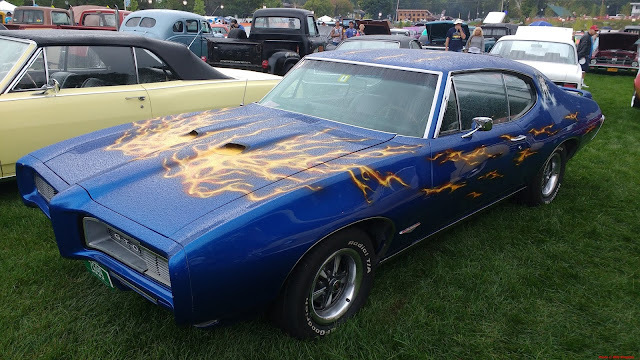 It was brutally hot on Thursday through Saturday, but I still went to the car show both Friday and Saturday, and I would say I saw about 80% of the show. Much more than I expected to do be able to do. I'm in a lot of pain, I knew that I would be. Was it worth it? ABSOLUTELY! It still feels "wrong" to drive past the street we used to stay on- every year from 1987-2012, it was really home away from home. The heat was tough and took a lot out of me. I am curious to see how long it will be before I'm not in constant pain from the show. (I'm in constant pain 24/7/365, but I'm referring specifically to pain caused by walking at the show). I really don't know. I am hoping to go to another car show this coming weekend, so it's possible I could be facing 4 weeks or more of pain caused by walking this show, if it works out where I can visit 3 car shows in three weeks. I ended up taking 1379 photos and videos on the trip, including my favorite video I've ever taken. I will post some of my favorite car show pictures below. Before that, though, are some of my favorite photos from the area taken on this trip. It's my favorite place in the world, and even though when I'm typing this up in August, still more than a week before we are even going to leave, I am already filled with more joy for the impending trip than I've felt in years. Literally! I'm not a happy person- it's hard to be happy when you feel terrible all the time. But Lake George...any trip to Lake George makes me happy. Getting there was just as incredible though as I thought it would be. I really can't put into words what it meant to me. As somebody who likes to write a LOT and has a fairly large lexicon, that is not something that happens all that often. Gotta say, the emotional impact almost overwhelmed me at times. The two large boats in the background seemed to have a drag race, going side by side up the Lake until they made the bend. There are 5 large boats on Lake George. the Mohican, launched in 1908, was the only one I did not see this trip. The Minne Ha-Ha (launched 1969) and the Lac Du Saint Sacremont (launched either 1990 or 1991- I saw her maiden sail but don't remember for sure) are run by the Lake George Steamboat Company. The Sacrament is the ship on the right here. The Horicon (foreground) has been on the Lake my whole life but I don't know when she was launched. The Adirondack (on the left) was launched circa 2007. The latter two are run by Shoreline Cruises, but I don't know about them as much. The Minne Ha-Ha is the star of the Lake and the video below features her prominently. She is not in this photo, but she had just come in for a landing after a cruise. I was able to capture 4 of her songs on the Calliope and all 4 of the big ships that I saw this trip. On Sunday, the big shops weren't running but it allowed me to get photos of them. I suspect the Mohican may have gone to Dry Dock already. This is English Brook, which ran behind the motel we stayed at this year. It drains into the Lake. You can see the rest of the photos from this trip (non-car show) HERE on my website. It also covers the trip up, back, and excursions into Saratoga, Ballston Spa, Warrensburg, Queensbury, Glens Falls, and more. A lot of the pictures are of Fort William Henry which is a reconstruction (with some originality) of a fort from the French and Indian War, originally built in 1755. Here are some car show photos. I took exactly 700 photos and videos at the car show, and I won't share them all here, but you can see them on my Website. I'm not going to post a whole lot because I am kicking around the idea of an automotive photography blog. This year was unusual not in that there was a Superbird, it was unusual because there was only one wing car! There are usually at least three on the grounds. This car was great looking in person, too. Note the Lake in the background. Now, I said there was not a lot of card content in this post, and that's true. But, we did find out that there was a new semi-card shop that opened in town in early 2016, and of course we made the effort to go to it. 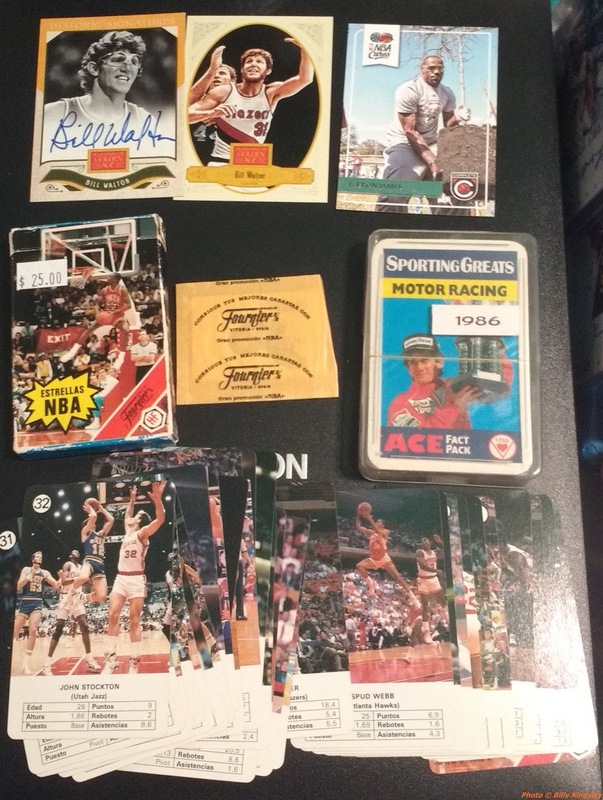 I did find some basketball cards in that local store in town, which are good. But I'm not going to show them now. I got some good stuff, of course, but...it pales in comparison to what I found at my favorite comic store, which I have not been to since roughly 2006. Yes, my first cards from the legendary 1938 Horrors of War set, and my first card from any of the 1966 Batman sets! I have been chasing both of these sets since roughly 2010 when I found out they existed! I've mentioned I wanted both sets in the past on various blogs. (both my own and in comments on others). Now, I have them! Those are the two biggest sets (not in size, but importance) that were missing from my non-sports collection. I got a great batch of comics so I could only afford one of each set, but the store had more...and two of the other Batman sets of different Bat colors. Next time, hopefully, they will still be there. Now that I know that I can physically do the show, which I was not sure on, there WILL be a next time, and I don't think we will be waiting a whole year to go back. In fact, if all goes well, we will be back the end of this month! I am targeting the Concourse D'elegance at the Saratoga Automobile Museum on September 24th/25th as my return trip, although it's not known now if it will actually happen. That's what I HOPE will happen. But, knowing from past experience, it won't. But I'm not going to stop hoping. Every year, with every draft class, I wonder what the future holds for the new rookies coming into the NBA. Which will have long careers, becoming icons in the process? Which ones will fail and be out of the league after their rookie contract expires? Which ones will have an average career (the average NBA career being 8 years)? It's hard to guess but it's fun to watch and see how it plays out. One of the things I love about the Trading Card Database is the copious amounts of statistics they provide. Recently they upped the stats page to show not just the top 100 in your collection but everything. I was looking at my charts and I have come to the conclusion that it will be very difficult for a person to crack my top 10. The most recent player in my all-time top 10 is Tim Duncan, who was drafted all the way back in 1997. He and Kobe Bryant are in fact the only two in my top ten who were not yet in the NBA when I discovered it in February 1996. Even my all-time favorite player, Elton Brand, (1999-00 class) does not crack my top 10 although I have gotten him up to 11th. The highest player drafted in the 2000s is, unsurprisingly, LeBron James. He ranks only 61st in my collection, tied with Joe Smith. In fact, in my top 100, there are only a scant 6 players drafted in 2000 or later. The others are Kenyon Martin (81st), Jason Richardson (86th), Tony Parker (87th), Pau Gasol (94th) and Darius Miles (98th). Even Carmelo Anthony and Dwayne Wade do not crack my top 100. They are actually tied, with Tyson Chandler, for 132nd. Granted, a large part of that fact is that the majority of my collection was built between 1996-2006. I took a break from the NBA which I now regret immensely, but I did not come back full time until 2012-13. Of the players drafted in the time period I was not collecting, Kevin Durant is highest...and he ranks 324th in my collection! The highest ranking player drafted in my NBA Renaissance is Anthony Davis, locked in a 14-way tie for 546th, with players like Dickey Simpkins, Oscar Robertson and others. My top 10 has been pretty much the same since I entered my collection onto the Database back in 2012. There has been some fluctuations in order but the people in the top ten have stayed pretty much the same. Soon, by the end of 2016, I will have moved Elton into the top 10, and I fully expect him to stay there and climb higher. He's the only player I actively chase singles of. I will add other players of course, but I mostly use the "low hanging fruit" method- I get whatever is cheapest and available. Doesn't matter the player or team, I want them all, so any I get is great for me! Now, the Database listings and my personal collections don't match. The Database tags team cards and multi-person cards to each person shown, whereas I keep track of how many multi-person, team, league leader cards, etc. The Database also counts college, which I do not. So each person shows as having more cards on the Database than I consider being in my collection. However, as I've mentioned in the past, I lost all my listings in a floppy disk crash circa 2004. I am slowly recreating it, and making it better than it originally was, but it's not a fast process by any means and I don't foresee myself completing it this decade. Someday I will, and then I'll really know what my stats are, but for now the Database listings will have to do. Just for fun, here are my Top 100, in order, according to the Trading Card Database. 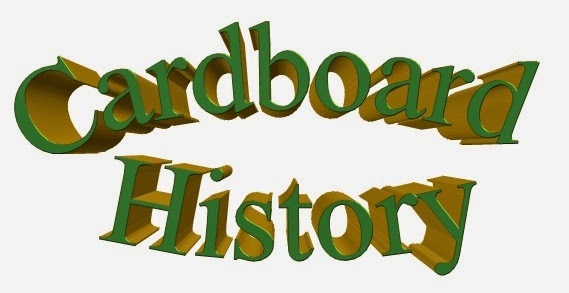 The Database shows 2290 people in my collection, but it's well over that as everyone with one card is tied at 2290th. The listings also include non-NBA cards, like college, multi-sport, WNBA, CBA, etc. 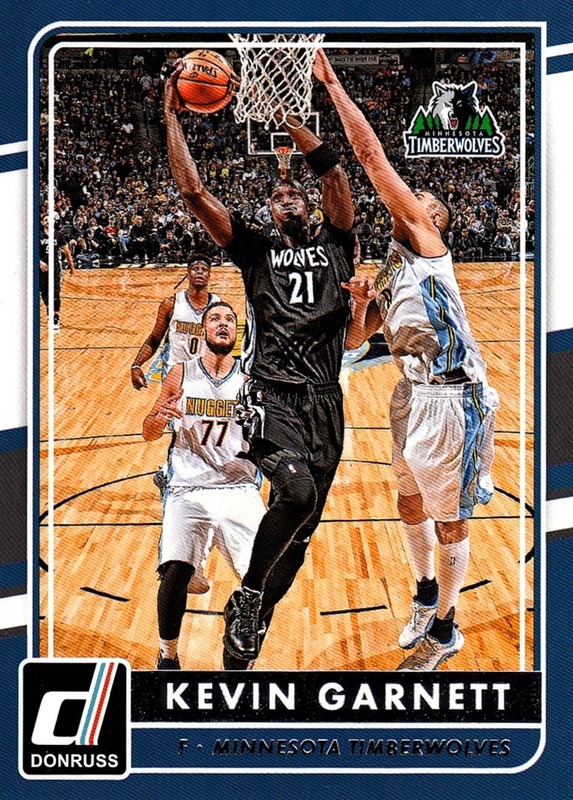 I only count actual NBA cards. I figured now would be a good time to post this as it's between the conclusion of my 20th anniversary season and before the 2016-17 cards start showing up, which, if Panini holds true to how they have done it in past years, is only about a month and a half from now. Made my first sale on COMC! That was a lot faster than I expected! 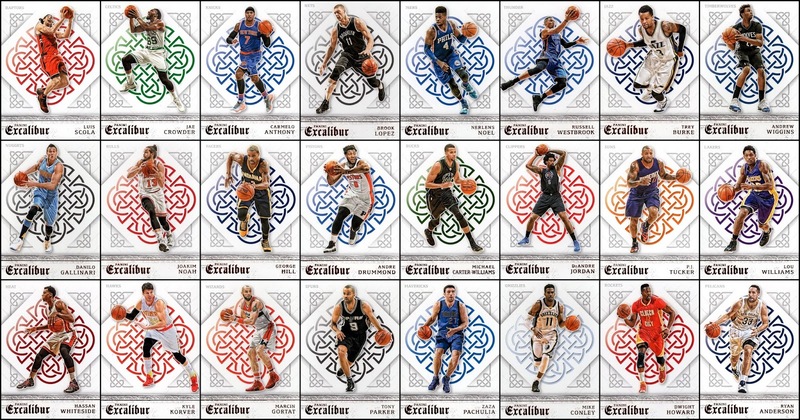 As I mentioned a while back, I was sending in some cards to COMC to sell off some duplicates, and maybe transfer that money if they sold to getting a card from Panini Eminence, the only NBA set missing from my collection (some other sets have come out since then). I sent the cards in back July and it took COMC some time to process them. That's OK. Being a first time submitter I didn't know how long it would take, and they eventually sent an estimate that they would be ready on September 26th. A ways off still. But they started being ready much sooner- the first four went live on August 31st. I didn't post about it because I figured I would wait and post when all 100 cards I sent were ready. The second batch of 16 cards went live last night, 9/3/16. It sold for $0.50 and gave me my first profit- a whole quarter! I'm shocked it happened so quickly, and I'm shocked which card it was that sold, considering this is just about the most common automotive set ever made. At one time I had almost two full sets. The second card that sold I have not scanned my copy of yet, but it was 1994 Skybox DC Stars #23 Aquaman. The Steph Curry card was just his Donruss base card from this year, of which I had three copies. Considering how fast it sold I might consider sending my second copy to COMC in my next shipment. There is one small thing I didn't forsee...the COMC account is in my mom's name. The first time we became familiar with the website is when she signed up to buy me a present. and we just kept using the same user name. So the cards are officially being sold on my mom's name. That's fine. there's a roughly 50% chance she purchased them for me in the first place, LOL. To see my duplicates for sale, here is the link: http://www.comc.com/Users/vanessak99 I tried to make sure every card there was the cheapest one available. I have no idea where this will go, and if it will allow me to ever get one of those expensive cards I wouldn't pay for myself, but it will be fun to find out! 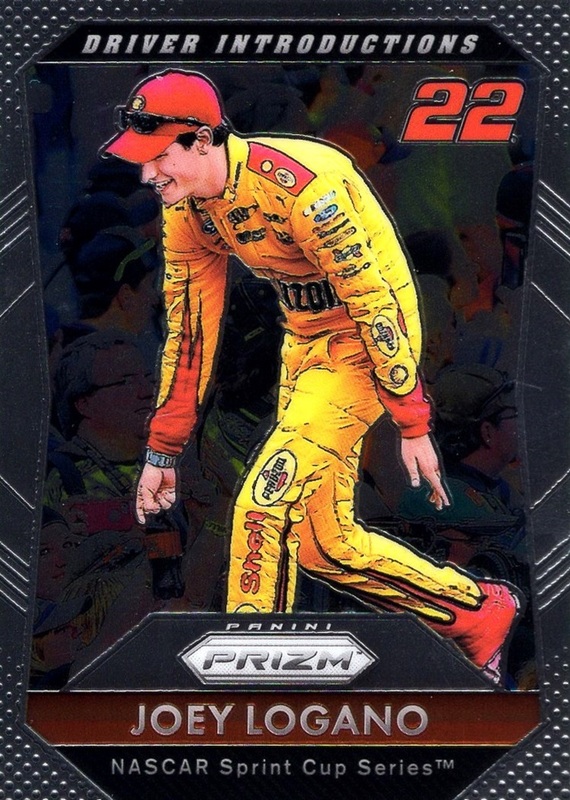 My local Target finally stocked the Prizm set, and they only put out one blaster, which my brother got for me yesterday. It was a little disappointing but upon reflection it isn't too bad. Each blaster of Prizm includes 24 cards, and for me exactly half of them were duplicates, including all three Prizm parallels which was the most disappointing...but I've already traded them for the remainder of the base cards I needed so it worked out pretty good in the end! For me Prizm seems to be a Matt Kenseth set with some other drivers. Kenseth is my second least favorite driver currently in Cup, so of course I get lots of cards of him. 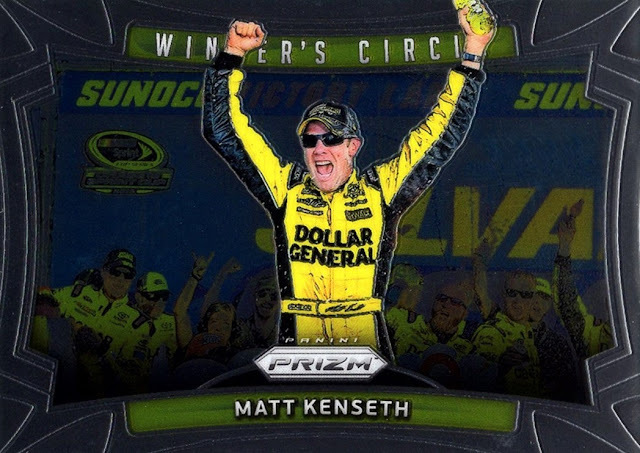 The Green Flag prizms are my favorite parallel in the set, so I am happy to get another, but it had to be Kenseth, of course. 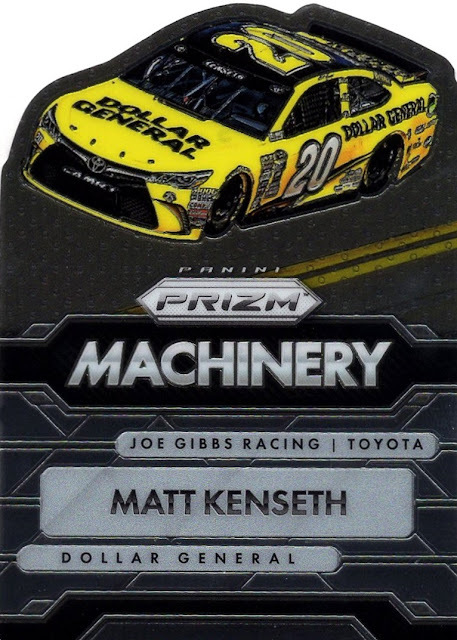 The tire piece came in the same pack as the Kenseth. It's SN25/75. 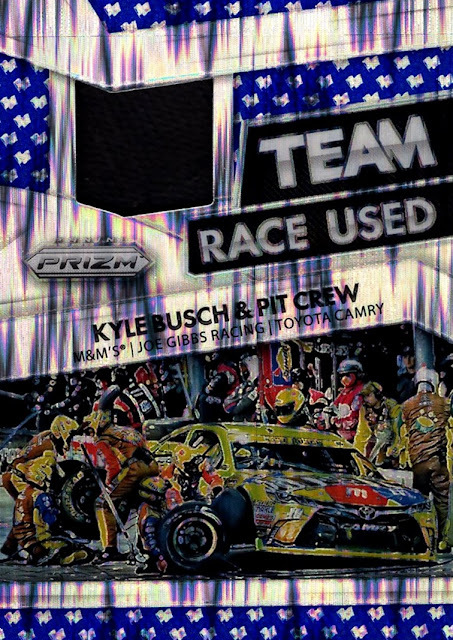 It looks like they are doing the same as Press Pass did, hobby versions of relics show the driver and retail versions the car. I don't have a problem with that. More cards to chase and you all know by now that I love the car cards. This looks much better in person, by the way. I got my first two die cut inserts in the same pack. Raising the Flag is really nice- car shots, some of them older. This one is from 2011. I have since pulled a Kyle Busch from the same set from when he won the Championship last year. Machinery is good as it's all car photos, but there's too much design and not enough photo. I think it would have worked better horizontal, something I rarely say. 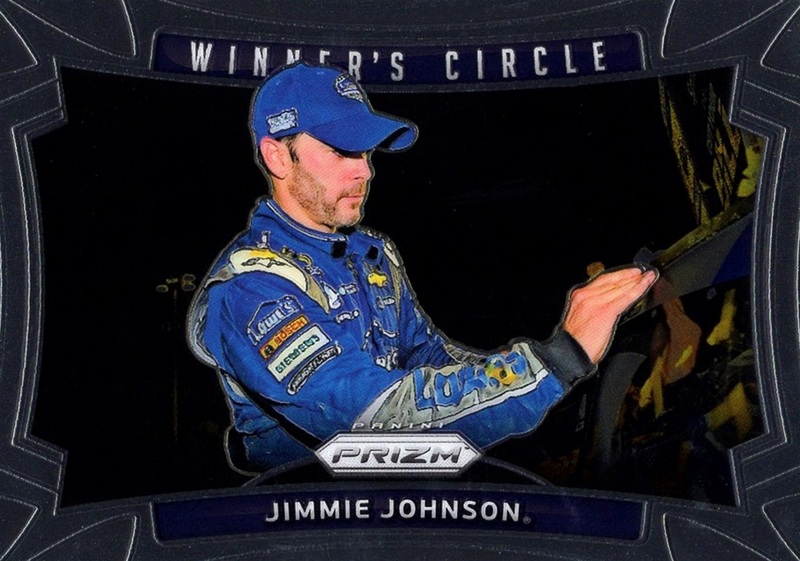 I also got another Winner's Circle insert. Guess who? 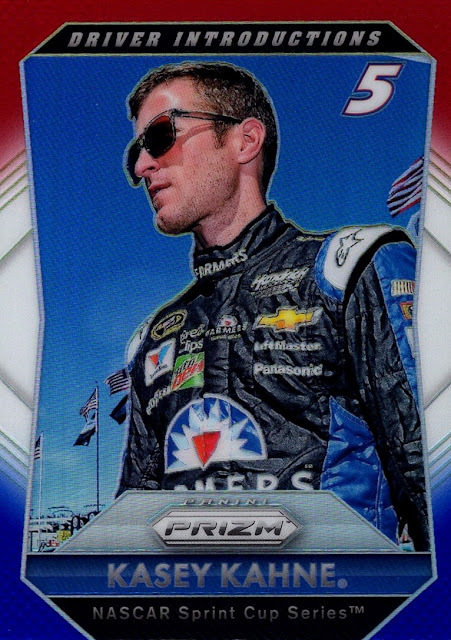 And then, out of the last pack, I got a Prizm parallel from the Winner's Circle insert...guess who...again? I also got 6 of the base cards I needed, as the hobby box only yielded 55 of of 100. And that's the entirety of the blaster. It will probably be the only one I open...I have all the base cards I need coming to me in the mail, and I don't know if I'll want to spend money to chase the parallels and the guaranteed one per box hit (either an Autograph or relic). Also, I got the only one available at my local Target already. So I might not even have the opportunity. 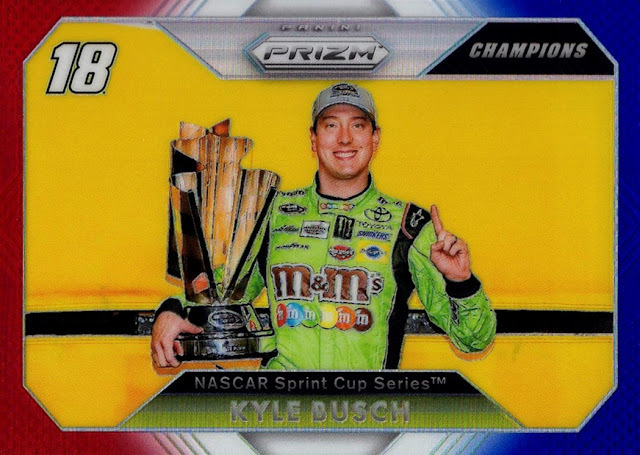 I'd like to get to Wal-Mart and try one from there as they have exclusive inserts as well, but our Wal-Mart is not good for cards and there is no guarantee they will ever stock them. 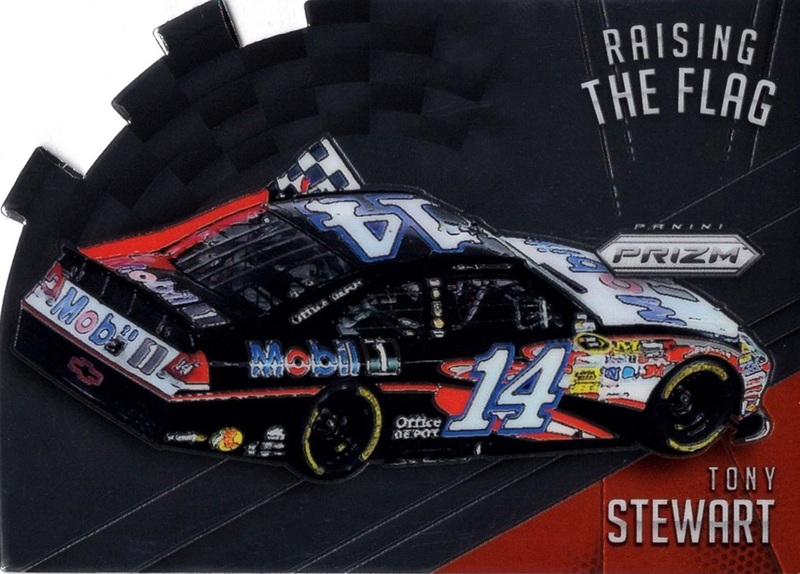 While I was there, they also put out the 15-card hanger pack, which has exclusive Red, White & Blue Prizms. I love them. I got two hangers, but only opened one when I made the scans for this post. Interestingly, I pulled the standard Prizms for all three of the RWB ones in my hobby box. 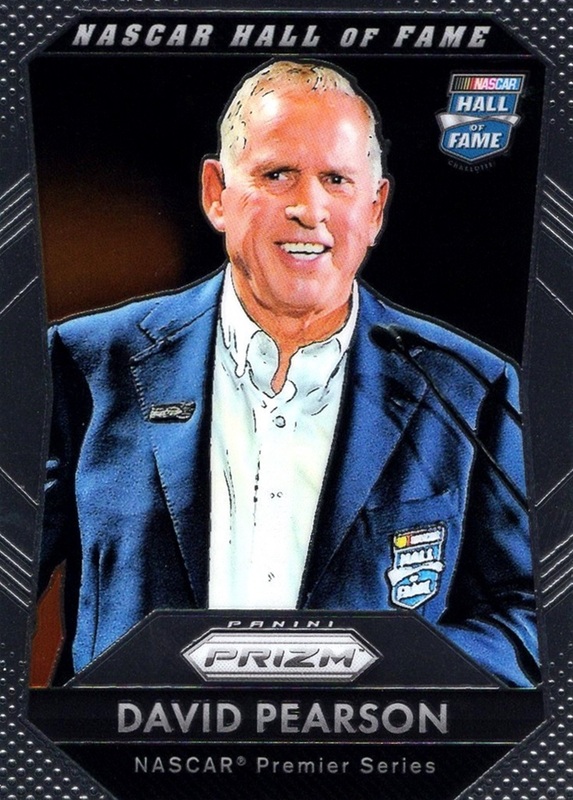 It appears the Legend variation Prizm does not have the borders. 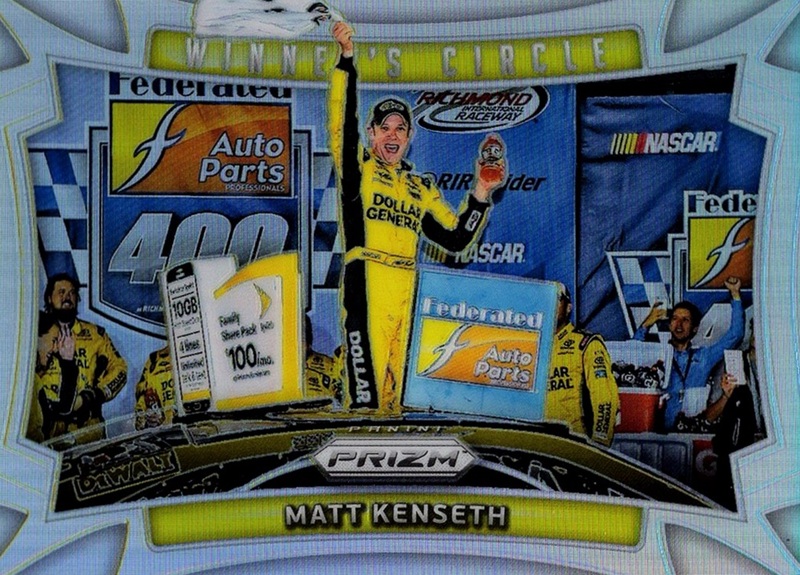 I like the Winner's Circle inserts. They are the most common. The second hanger gave me 10 new cards out of the 15 so it was the better of the two. 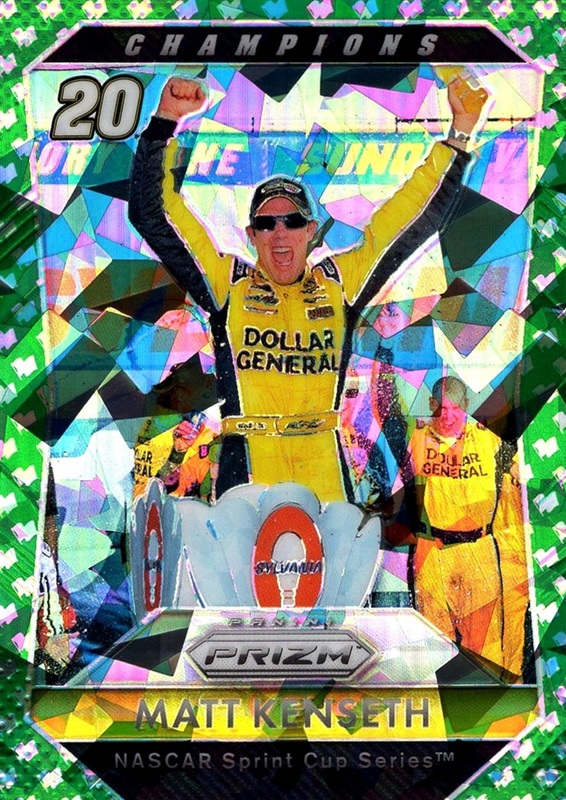 Of course I managed to get ANOTHER Kenseth Prizm out of it. 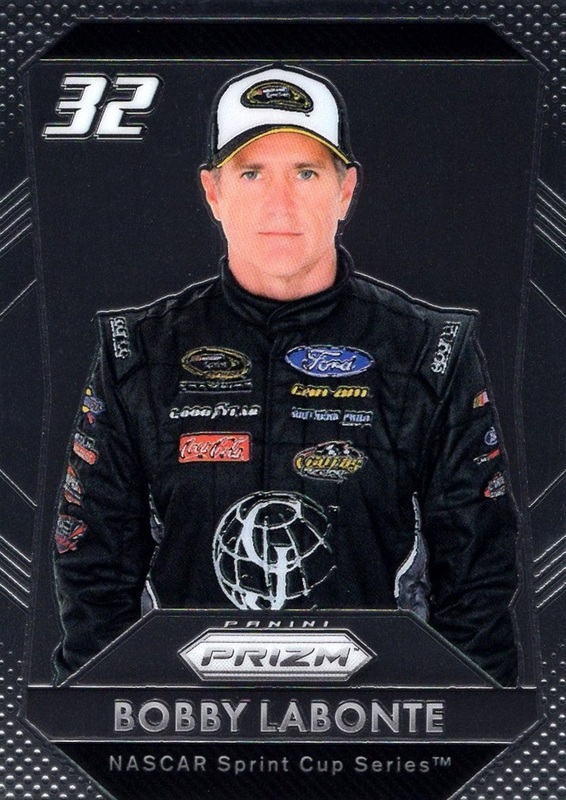 Oh well, at least it wasn't Clint Bowyer. 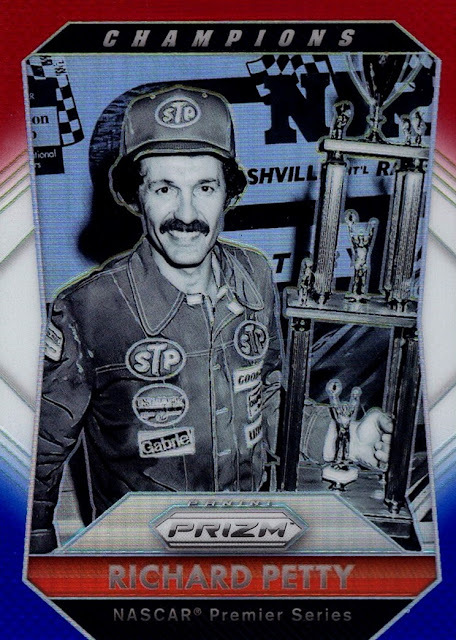 I still think this is a great debut set from Panini and I'm happy to know that I will be completing it shortly, and I really love the various Prizm parallels that look much nicer in hand than in scans. The real reason for heading to Target though was because my phone got too full to play Simpsons Tapped Out anymore...so my brother bought me a tablet! I have finally moved into the 21st century :) And yes, that is a direct link to Cardboard History on my main screen on my phone! If any of you in the blogosphere play Tapped Out, let's be neighbors!